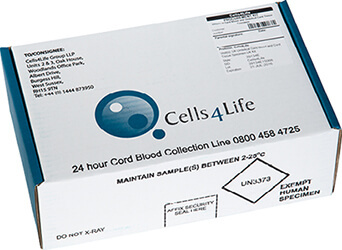 The Cells4Life Cord Blood Collection Kit has been designed to protect your baby’s sample during its delivery to our laboratory. Not only is it important to make sure that the sample arrives to be processed as soon as possible, but it should also be maintained between 2 and 25°C during transit. Cells4Life is the only bank to place a monitoring probe within your Kit, to check that your sample has remained within the optimum temperature range throughout its journey back to us. In order to request a stem cell Collection Kit and set up your baby’s cord blood storage service, you need to fill out our digital consent forms, which can be completed in a few minutes from your email box. Once all required documentation is in place, a Cells4Life Umbilical Cord Blood Collection Kit will be sent by special delivery to your given address. We can usually arrange for the collection kit to be with you by the following day, provided we receive the consent forms prior to 4pm. If you require a stem cell Collection Kit in an emergency, you can contact our dedicated on-call team at any time and we will be able to arrange for a Collection Kit to be couriered to your location. With Cells4Life, it is never too late in the pregnancy to try and set up your baby’s stem cell storage service, as we know what an important decision it is. That being said, we recommend that you get things in place as soon as possible as it ensures that the collection is not missed as a result of baby coming earlier than expected, leaves time for your phlebotomist to contact you prior to birth, and reduces stress on the big day. Your collection kit and all of the items within it have their own barcode and ID number. These are completely unique to your baby and ensure that the entire process of cord blood collection, processing and storage is fully traceable, from end to end. All of these items, as well as pictorial instructions are contained within the tamper evident packaging inside the Cells4Life Collection Kit box. Please do not open the packaging until it is required for use and don’t forget to take it with you to the hospital on the big day!